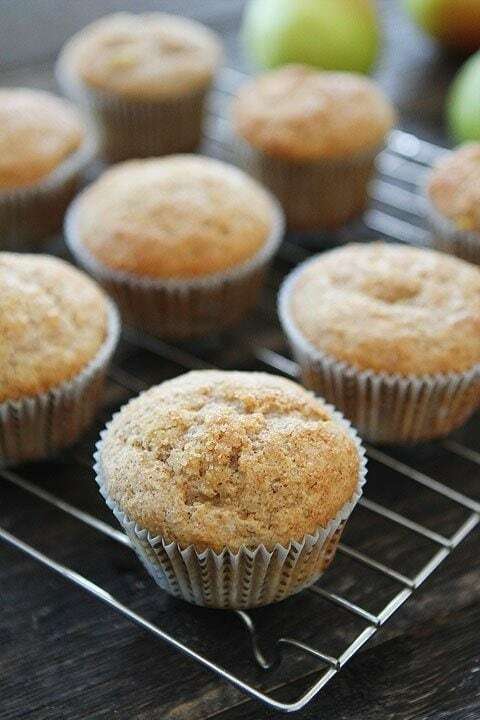 Honey Pear Muffins-sweet honey muffins with juicy pears and Fall spices. 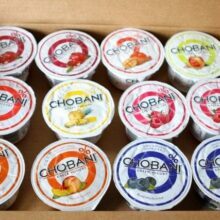 Add them to your breakfast menu today! TGIF! Do you have any fun weekend plans? Add baking Honey Pear Muffins to your weekend agenda. I promise they will help make your weekend a good one! Don’t worry, they are easy to make so you don’t have to spend all weekend slaving over these muffins. You can whip them up in no time! The weekends are usually busy for us, but we always find time for a special breakfast. Pancakes, waffles, French toast, baked oatmeal, scones, or muffins are a must! We always mix it up, but Saturday and Sunday are made for enjoying special breakfasts. Last weekend we turned on Saturday morning cartoons for Caleb and made Honey Pear Muffins. I love making muffins because they are simple and so satisfying. I love that every person gets their own little treat! 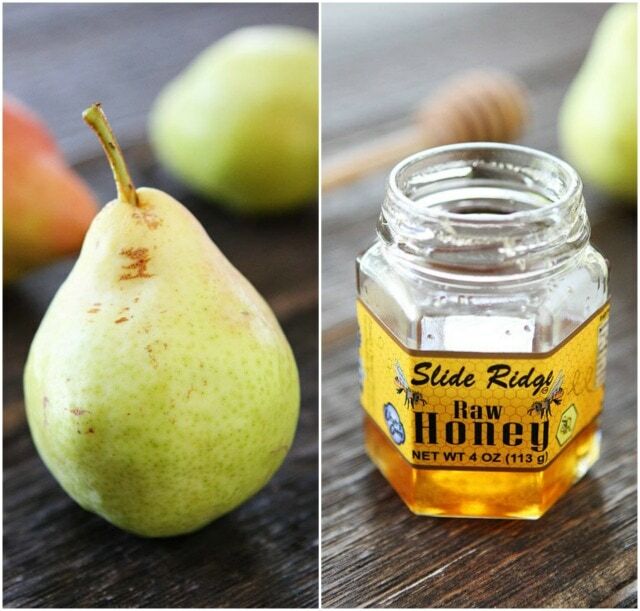 Pears and honey are a delicious combo and I use the combo a lot. For example, in our Pear, Brie, and Honey Quesadillas and in our Grilled Pear, Brie, and Honey Crostini. Sooooo good! The pear and honey combo wins again with these marvelous muffins! 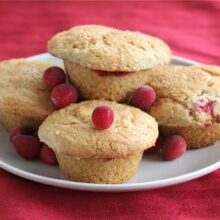 The muffins are sweet with a hint of fall spices and dotted with juicy pear pieces. We topped our muffins with a drizzle of honey and savored every single bite! 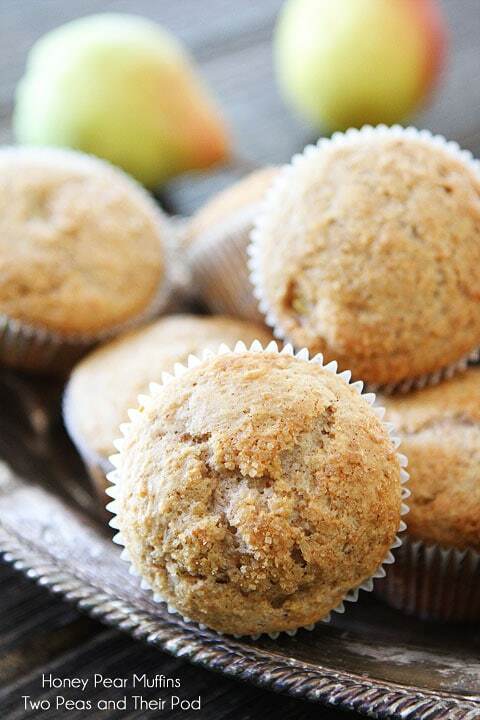 Honey Pear Muffins will make your weekend a little sweeter. Make a batch and enjoy! 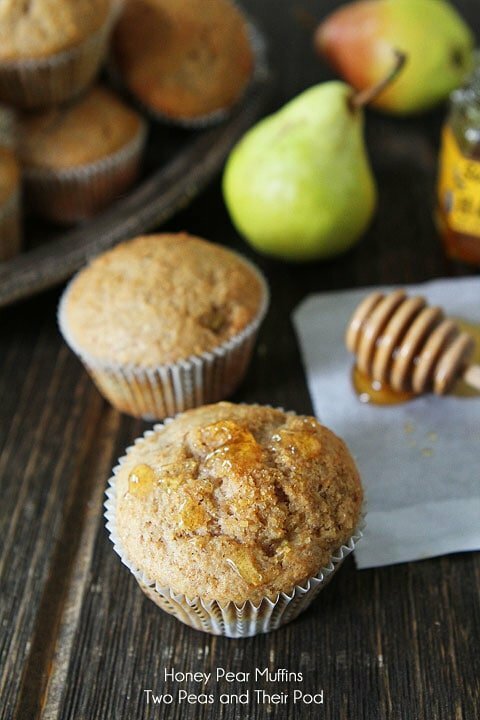 Top Honey Pear Muffins with a drizzle of honey for an extra special breakfast treat! 1. Preheat oven to 375 degrees F. Line muffin pans with paper liners or coat with cooking spray. Set aside. 3. In a small bowl, whisk together buttermilk, butter, honey, egg, and vanilla. Pour the liquid mixture over the dry ingredients and stir until flour disappears. Gently stir in the pears. 4. Fill muffin cups 3/4 of the way full. Sprinkle each with turbinado sugar and bake for 18-20 minutes or until a toothpick stuck in the middle comes out clean. Let cool for 5 minutes. Serve warm. We just moved into a new house and I haven’t baked anything yet. This weekend I need some muffins. The perfect welcome home. This looks like the perfect fall muffin! I actually have a pear in my pantry that is screaming to be put into a muffin so I might just try this recipe. 🙂 Have a great weekend! These muffins look the perfect breakfast, except I may need 2 or 3! One just will not cute it! Oh these muffins look amazing. I often feel like I over look pears. I do so much with apple I forget to use up the seasonal pears as well! Love that you make sure to have a special breakfast sometimes! It’s always nice to sit down to a delicious treat in the morning. Muffins are great and pears are wonderful in baked goods! I have some red pears I need to use. This sounds great. Think I’ll add so e walnuts because I like a little crunch! 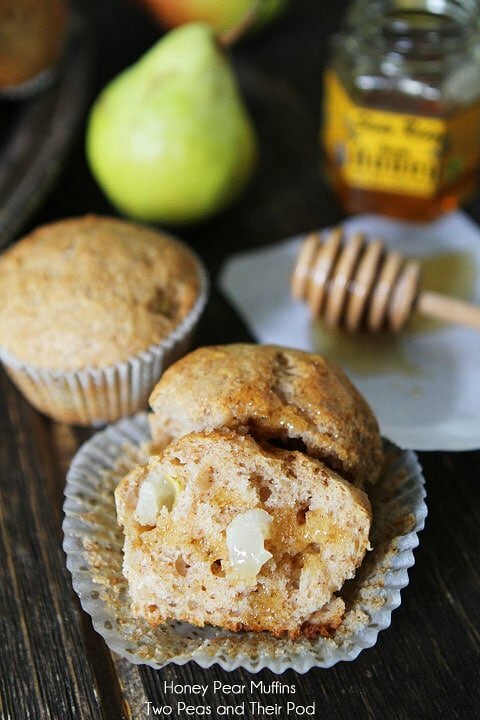 the honey paired with those pear muffins would just take them over the top! yum! These would be the perfect breakfast for a fall weekend–they are beautiful! Made these this morning, right after I got the post! I didn’t have ground ginger, so I minced some fresh ginger and added it with wet ingredients! Also made 6 large muffins instead of regular size! So easy and DELICIOUS!!!! adore this! 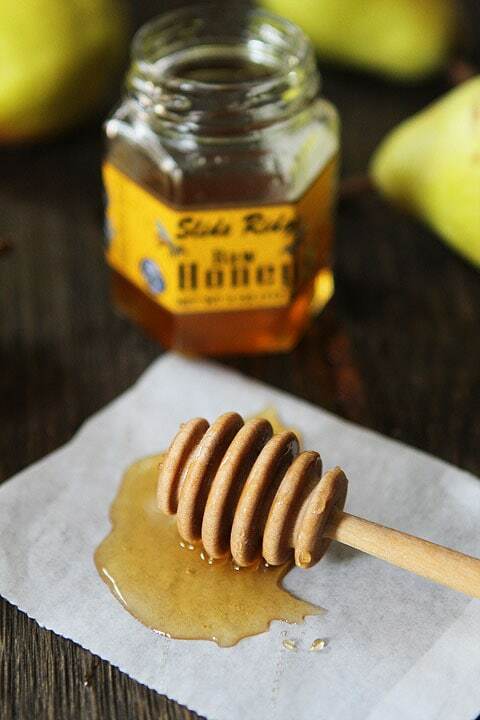 honey and pears are a great combo! These look SO GOOD! And, I am looking for easy things to eat on the go as me and the hubs have an upcoming 10 day road trip planned…perfect timing! Prettiest muffins, I love that honey drizzle! These muffins look delicious! Love the use of pears! These look so good! I love pears in baked goods – and you don’t see them that often! These would be great to bring into the office! I really enjoy fresh pears and am always looking for interesting recipes beyond my favorite pear tart. We will have to try this. Maybe add some almond because I love that combo. Thanks for sharing. 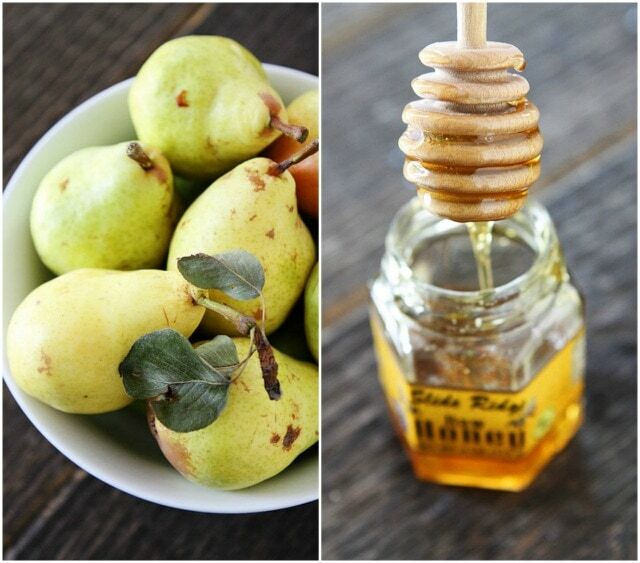 Mmm, love the pear and honey combo. Beautiful photos!! I’ve never tried pear in a muffin before. These sound awesome!! I love all the pear recipes you have been sharing. The muffins look like the perfect breakfast treat! I have never baked with pears! These look fabulous! I should bake more with pears and honey. These muffins look fabulous, Maria! I had some pears I needed to use and this was the perfect recipe. I made the muffins this morning and love them. I normally don’t make muffins, but your recipe sounded too good to be true. Thank you so much for sharing. The muffins were delicious! The contents of these muffins made me try these. Its a healthy muffin recipe I feel. They came out really good and taste healthy too. Thanks for the recipe. With that drizzle of honey, how can I resist?! I made these this morning and they taste great! And also my house smells really good right now 🙂 I made some substitutions for the dairy and they still came out amazing. And at only a 110 kcal a piece I can have 2 for breakfast! 😀 Thank you for sharing. 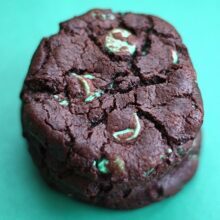 Hi, I would love to make these but I don’t have the whole wheat flour, can anyone tell me if I could replace it with the regular, all purpose one? And use 2 cups instead of one? TIA! Yes, you can use all-purpose flour! I just bought a whole bunch of pairs. 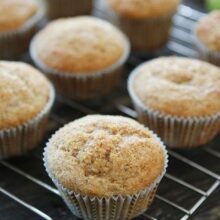 I think I just might add baking honey pear muffins to my weekend agenda! Thanks for sharing! This is really an amazing recipe. Glad to read your post. Love the recipe shared. Surely will try. Thank you for sharing. YUM! Just took mine out of the oven they are delicious. I also added some lemon zest. Any idea how to adjust the cooking time for mini muffins for the kiddos? These muffins were truly yummy but mine were very dense the first time around. I found a site (http://www.thekitchn.com/help-how-do-i-fix-my-muffin-re-78114) that recommended reducing the baking powder to 2 tsp as too much will make them rise and then fall flat – like mine! Oh, and added 1/4 tsp of baking soda to help counteract the buttermilk’s acidity. This made them lighter, not so dense and didn’t affect the flavor. just made these! YUM…but I noticed they really stick to the muffin paper liners…do you have this issue? Do you have a trick to fix it? I didn’t have a problem. You can try spraying the muffing liners with cooking spray. I had some pears sitting on my kitchen counter and was thinking about making some pear muffins so they wouldn’t go to waste. I searched pinterest and found your recipe. I made this morning and the recipe is a keeper. I added 1/2 cup of pecans too. Thanks! I love these muffins and so does my son. I’ve made them 3 times now and they’re great each time. I’ve adjusted the recipe slightly as to what i had i stock – I reduced the sugar to 1/4 cup, combined 2 tablespoons of plain yogurt with milk instead of buttermilk and used sunflower oil instead of butter. Still delicious! I’ve also added berries when I didn’t have enough pear. Thanks for the great recipe, this will be a family favourite from now on. This recipe was a slam dunk, home run on every possible level. I can’t wait to make it again. 1 cup of pears was equal to two pears. I mashed them and their own juice added to the mix made it easy to stir together. I will definitely be making this recipe again. I made these today substituting cardamom for the spices (I added less than a tsp) & almond extract for the vanilla (because pear & cardamom are one of my favorite combos). Oh, & since I was making them for my son, I cut the sugar down to just 1/4 cup. They are delicious! Perfect fluffy texture. I will definitely make them again! Thanks! Are the pears peeled then diced or just diced? Thanks. Looks delicious. Could you sub out the whole wheat flour for almond meal? Very nice recipe–made them this morning. These are my favorite muffins!!! I have made them for several people and they always ask for your recipe. They are in my oven baking right now. I believe the honey makes them extra sweet. These look lovely, but I don’t have any buttermilk… Do you have a workaround? I don’t usually comment on recipes, but I really wanted to thank you for this one! Made these yesterday and they were DELICIOUS!!!! I love the honey, pear and spice combination and the crunchy sugar topping. They’re moist and sweet and insanely good. I am making a second batch right now! I am so glad you liked the muffins. Thanks for taking the time to leave a comment! I have a box of pears that are right on the other side of their prime. 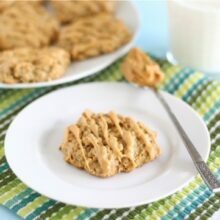 I also happened to have buttermilk in the fridge so this recipe is just what I needed! They are delicious! They look and sound so good! I want to make these this week. I have planned to bake some muffins for my parents as they will be visiting my home soon. I’m sure they would love this! Thank you so much for the recipe!